If you follow my posts you remember that I advocate that investors should not be predicting the market or stocks. Such behavior has no place in the stock market. If you base your trading on predictions, forecasts, or magic, you are definitely set for losing your money. Many times I said here in this blog that you do not need to know what the stock or market will do next, but you need to know what you will do next. If you are prepared before you enter a trade and know what to do in every outcome and every move Mr. Market throws at you then you really do not need to know what will happen in the market next. You do not need to predict the future. And all available crystal balls were sold out anyway. This is the number #1 problem investors and traders get into. They know perfectly how to put up a trade but have no clue what to do next, how to manage the trade and how or when to get out. And when the trade goes against them and they lose money, they blame the market, Fed, high frequency trading, market makers, bad weather, or improper constellation of the stars. Here are a few steps how you can fix deep in the money puts, jade lizards or strangles. Once I had a trader who asked me a question what do I do when I open a trade and the very next day the stock tanks. How do I predict this and prevent myself from entering the trade right before the stock collapses. I told him: “You can’t”. You cannot predict future. There is absolutely no way that you can predict what event sends the stock to abyss or shoots it into the sky. All you can do is get ready for all possible outcomes of the trade, have a plan for each event, and if any of that event happens, execute that plan. So let’s review step by step what you can do when trading naked puts, jade lizards, or strangles and the trade turns sour the very next day. Remember, the steps described below can be used (in a proper modification) for almost any trade. You can use them with spreads, naked puts, naked calls, or jade lizards. In this post I will show it as if we traded a strangle. 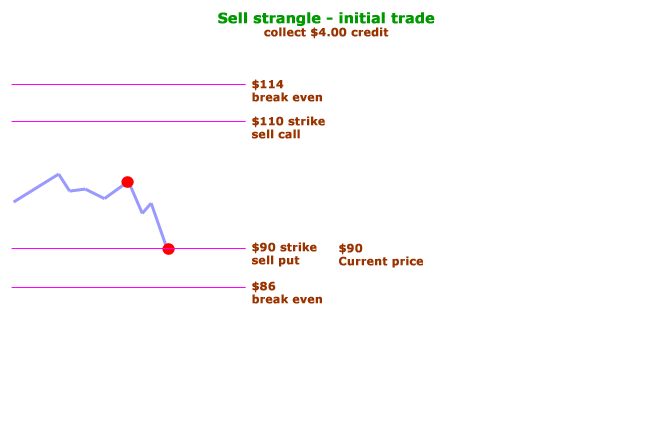 A strangle is when you sell a naked put and a naked call at the same time. It is a high probability credit trade (you get paid for this trade). But sometimes it can turn bad. The picture above shows a typical strangle. Let’s say that a stock XYZ is trading at $100 a share. We decided to sell $90 strike put and $110 strike call (both legs with delta 20). For this trade we collected a premium $4.00 dollars, so our break even prices are $114 on call side and $86 on put side. Remember, with strangle, you will never lose on both sides. Only one side can get into a danger at a time. If your put gets in danger, you calls will make you money. If your calls get into trouble, your puts will make you money. Let’s say we weren’t much lucky and some usually unknown analyst you have never heard of before issues a warning that he thinks the company will not do well in the next quarter. Sometimes this is enough to send the stock down. Now, our puts are in danger. What would you do? Sometimes it is difficult to choose the proper defense. If you have a plenty of time until expiration you may choose to wait and see if the stock recovers or choose to take action and adjust the trade. Many times in the past I decided to wait and the stock tanked more making things worse. On other occasions I decided not to wait, make adjustment, but the stock recovered and the adjustment turned against me. Can you prevent such situation? Again, you cannot. If we knew what the future was going to be, we would be billionaires. Let’s say we no longer feel comfortable with the trade, take the analyst’s warning seriously and decide to take action and adjust the trade. If the stock tanks and the price goes and touches your naked put side or goes even lower but stays above your break even price, then you roll down your call side. You buy back your almost worthless calls and sell new calls close to the current price or same delta (in our example it was delta 20). For this, you collect additional premium. That premium will further lower your break even price from the original $86 to $85 dollars. But what if you do this adjustment and the stock recovers and continues higher? Your naked calls will now be in the money. Many people and novice traders have a panic fear of naked calls in the money. They immediately see it as a huge danger to their portfolio. Many stay away from naked calls because they have no clue where the risk is. What would you do then when your calls go in the money and your broker is telling you that now your risk is unlimited and you can lose everything and even what you do not have? · Step 3 – How rolling calls saves my ITM puts? It doesn’t make the ITM puts to go away. If you do the above described adjustment you still may end up with an ITM put and OTM call. So you may ask, what’s the point of such adjustment? First of all, you collected more credit which may help you offset the price of the put should you buy it back at a loss. Or, if you are like me and do not want to take a loss, you may decide to roll the put lower into the next month (or week) get more credit and improve the outcome of the trade. 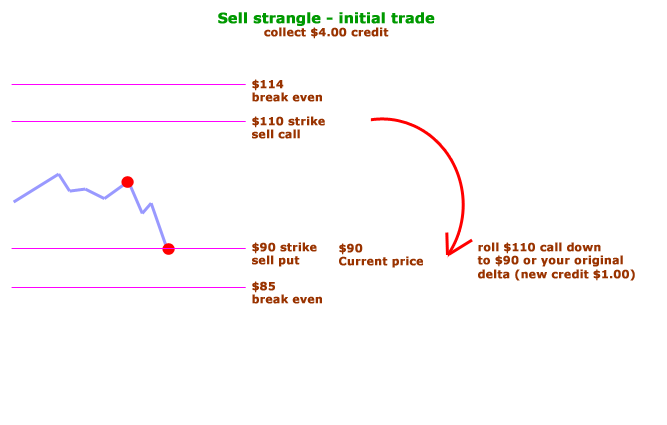 When you roll your put away and down, you collect a new small credit, make the puts OTM again and you may decide to sell a new OTM call against the new rolled puts making your trade a new strangle, collecting even more credit. 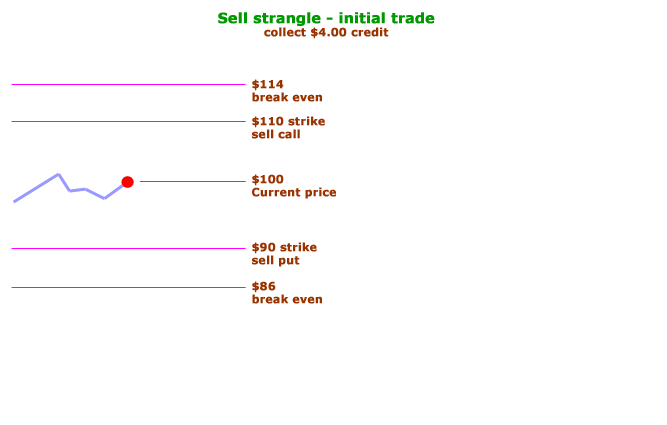 The new strangle with lower strikes on a stock which went down has now a lot better chance to be bought back for 50% credit than the original one. Or even expire worthless. You will be out of the originally losing trade as a winner. But if this doesn’t help and the stock continues giving you a hard time you may choose more defensive steps. Sometimes you end up rolling the trade, making adjustments but it doesn’t help in the end. Sometimes the stock tanks and smashes through your puts side without a mercy and your puts end up in the money. Now it is a time for an exciting adjustment – inverted strangle. Let’s assume the stock didn’t stop at $90 a share and the very next day after you adjusted your original trade it smashed down below your break even price. You now know that there is a very little chance that the stock would move back up above your original $90 strike put. For example, you only have two weeks to expiration and the stock would have to move a lot to get back up above $90 strike and such move is highly unlikely. How do you invert a strangle? You buy back a worthless $110 call and sell a new in the money (ITM) call at e.g. $78 strike. For this adjustment you collect another large credit. You now have in the money puts and in the money calls. · Step 5 – What now? Now I can see many investors freaking out. In the money puts and calls? Are you crazy? No, I am not crazy. It is not an end of the world and there is plenty of ways how you can further work with those options. Let’s review what outcomes can happen and how to deal with them. 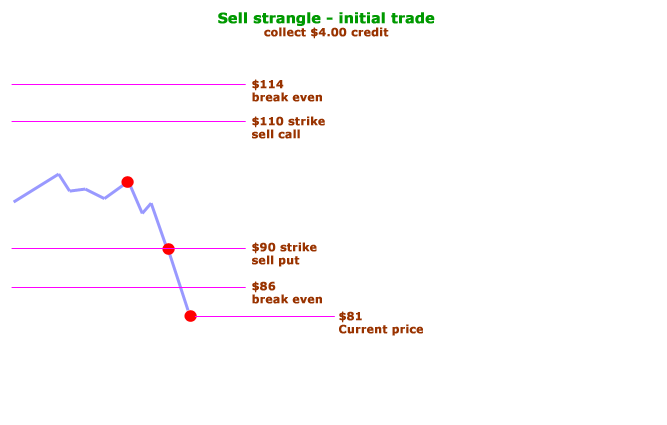 First, your inverted strangle must always stay in the money in order to finish this trade as a winner. Our puts and calls will be assigned against each other. At expiration, we will buy 100 shares and sell 100 shares at the same time and realize either a loss or gain from the difference. This result will vary based on the trade and situation. I had a trade against LULU for example where I ended with $313 loss, but I had a trade against WYNN where I had only $65 dollars loss. Two days before expiration you roll the entire strangle into the next week or month. You must roll the entire in the money strangle. Doing this you will collect another credit, e.g. $2.50 or $250 dollars. That would lower your $400 loss down to $150. You can choose to take the loss and move on or roll again and end the trade with a small gain of $50 for example. Or roll once more and end with a $300 gain (note the numbers are examples only). You can also choose rolling to a lower put strike to improve a chance of getting a better outcome. 3) What if the stock continues falling? This may of course happen. You make an adjustment two weeks prior to expiration and two days to expiration the stock slides to $68 a share. Now your puts are deep in the money ($90 strike) and your calls ($78 strike) are now OTM. What to do? In this case we will let our out of the money calls expire worthless and we will roll our deep in the money putsinto the next period and down. At the same time we will sell new in the money calls, e.g. at $60 strike. For this we will collect premium. If the premium is large enough to offset the spread width loss, then in the next expiration we will let both options offset each other. If the spread is too large, we will have to roll again and try to get the options legs closer together and for credit (when rolling into the next month or week we attempt to roll calls higher and puts lower but still keep them in the money. 3) What if the stock recovers and goes up? This is a similar situation as described above. Now our puts will be OTM and our calls deep ITM. You take the same approach as described above but reversed. 3) What if I get assigned? First of all, remember that 90% of all options expire worthless and are used by traders. Only about 10% is used by investors as a hedge when they are actually interested in buying or selling stocks via options. So your chance of getting early assigned is low. But it can happen. We are in the money after all. What happens if your puts get assigned? Buy the stock, start collecting dividends, start selling covered calls, and sell a new in the money puts. This is not a big deal as we like selling puts against dividend stocks, so buying the stock is a part of our strategy anyway. What happens if your calls get assigned? This is pretty much all about defending puts (or calls) using inverted strangles. As I mentioned above, you can use this strategy with any option structure. If you only have naked puts and they get into trouble, add a naked call to your trade and then work with it as a strangle. 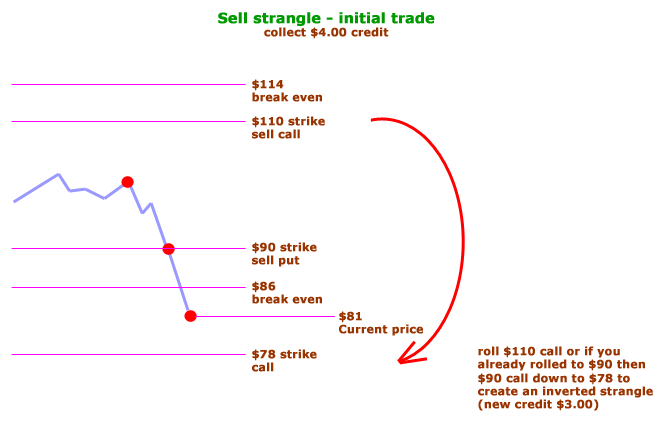 If you have a jade lizard (which usually consists of a call spread and naked put) then use your short options only, treat the entire structure as a strangle, and let your long call expire worthless (or buy it back if it still has some value in it). There are ton of possibilities of what you can do with your trade. Just keep enough money (buying power) in your account, stay calm, evaluate all your options before taking a step. If you are not sure what to do and expiration is approaching, then just roll your trade as is into the next period (month or week) to gain some time to make a decision. It is not difficult to do. There are indeed a lot of ways to deal with ITM trades. My first ITM trade scared me. U am more relaxed about it now. Yes it is all about knowing that it is not the end of the world and that there are a plenty of ways to deal with it. At first, a few years ago, I was scared too, but once it “clicked” to me that I can manage those calls and play with them like playing a chess, it no longer scares me and makes me relaxed too.